Al, I love ya man. But I hope neither one of us starts another 2015-related thread after today. In for delicious Mets tears. This is the first morning in my life as a fan that I woke up a winner and KNEW in my heart I was going to bed the fan of a Champion. Never thought I would say that I don't want to see another home game this year. Me too, I'm almost crying just thinking about it. Too nervous to watch last night. Will definitely be watching tonight. I wanna see Chris Rock and Jerry Seinfeld cry. I will be crying like a baby as well if we win. Deciding if I should go down to P&L District tonight. Fresh Deer Tenderloin and Crown Town Ale from last year ready to GOOOOOO!!! 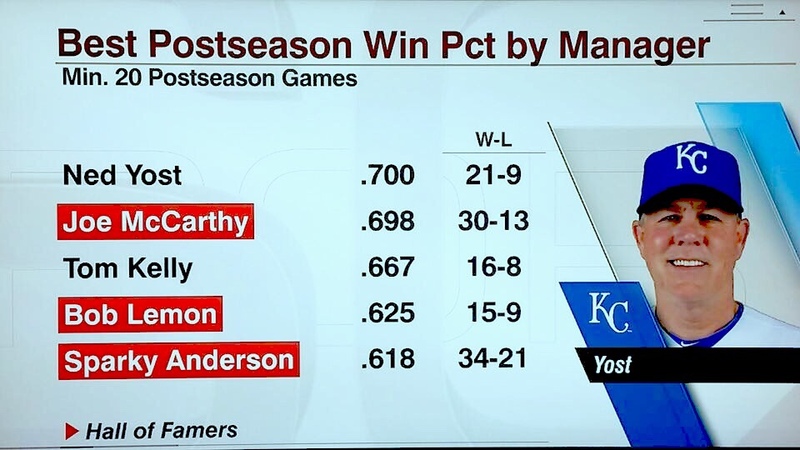 Think about this...Ned Yost could be 22-9 in the postseason. Let that sink in. #Yosted has a new meaning!